Beau Monde, follows on from Stacey's previous exhibition Supermodels 2005. In this major body of work she continues her exploration of natural historical collections. This series was created in response to the Macleay Collection housed at the University of Sydney. The collection was instigated by Alexander Macleay, who arrived in Sydney with his family in 1826, bringing with him an already extensive collection from Europe. This, combined with what Macleay proceeded to collect in the Asia Pacific region, became the cornerstone of science in Australia. It spawned the Australian Museum, the collection in the Botanic Garden as well as the Macleay Museum. Stacey has photographed specimens, artefacts and scientific models then presented these works in a contemporary context. In Beau Monde (Yellow), for example, a black ball is covered with butterflies and transformed into a beautiful new world. Is this surrealist invention or scientific method? Other works reference Dutch still life paintings but are designed to encourage a renewed vision of the objects on display, considering their aesthetic and scientific power. With her unprecedented access to important and relatively hidden natural history collections, Stacey allows us to contemplate the act of collecting and the underlying drive to classify and categorise the natural environment by assembling specimens and objects. She also reveals the idiosyncratic character of collectors' personal obsessions and the interests and individual histories that are reflected in the objects they assemble. 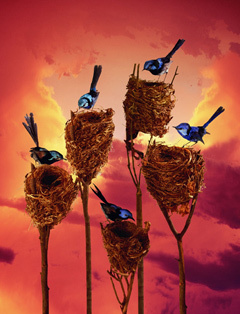 Robyn Stacey is one of Australia's foremost photo-artists. She has exhibited in numerous solo and group exhibitions both in Australia and overseas since the mid 1980's. Her photographic works are held in the collections of Artbank, National Gallery of Australia, Art Gallery of New South Wales, Art Gallery of Western Australia, National Gallery of Victoria and Queensland Art Gallery.